Anchor Text plays an important role into the SEO of a link because it communicates a level of relevancy to search engine bots. Therefore, it’s a good idea to conduct research on the backlinks going to your site or your competitor’s site to see the most common anchors and get an idea of the topics that search engines associate with your site. The Backlinks Anchors report gives users a list of the most common anchor text used in the backlinks going to the domain. The table will list these anchors in order by the most backlinks using each anchor, listing the most popular anchors at the top. If you have any questions regarding the anchor texts mentioned in the Backlink Audit tool such as money, compound, branded, etc. please read About Anchor Texts in Backlink Audit. For example, among lids.com’s most popular anchors are “lids blog,” "download hat size ruler," and “nba” which tells search engines that this site offers hat-related and NBA-related products. Therefore, search engines can determine that lids.com may be helpful to searchers that are shopping for hats, and especially NBA-related hats. You’ll probably also notice “empty anchor” listed in this table. An empty anchor is either a sign of a link with no anchor text (the entire landing page URL linked on the source URL) or an image link, which would have no anchor text. You can investigate any of your “empty anchor” backlinks by selecting the blue number of backlinks in the next column. Analyzing anchor texts from a competitor’s backlink profile gives you the chance to see any topics are associated with their backlinks. If you see a trend or common topic that appears in the anchor text of number of their links, you could infer that there was a marketing or PR initiative behind building those links to promote the product or service offered by your competitor. 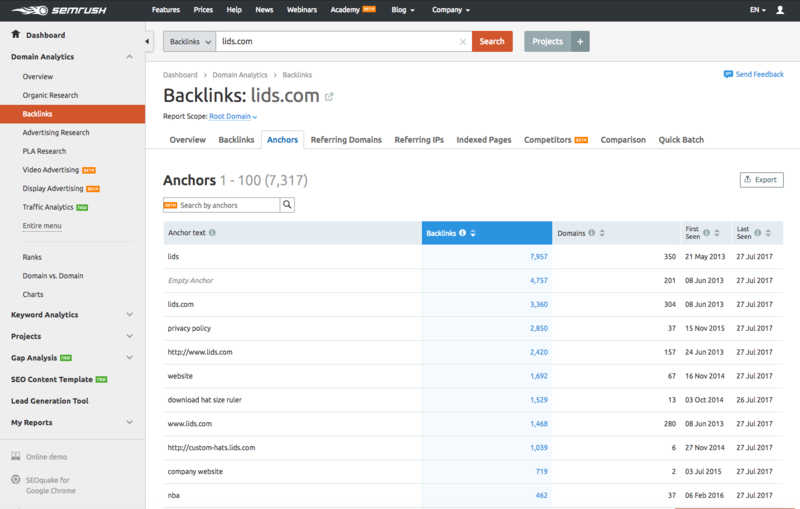 The search function in this report makes it easy to look for topics that your competitor acquires backlinks about. As you type a letter into the search bar, SEMrush will begin to auto-suggest phrases based on the anchor texts that exist in your competitor’s backlink profile. So if your competitor has a huge backlink profile and you’re not sure where to start, you can enter any letter and find products or services you suspect your competitor uses to get backlinks. You can also sort this report by the number of unique domains using the anchor, when the anchor was first seen, or when it was last seen. Please note: At this time, the search function in the anchors report is only available for domains with less than one million backlinks. Users can export this report to CSV, excel, or CSV semicolon to further conduct and organize research outside of our software.